Sitting high atop Haleakala on the island of Maui is a magnificent refuge called Waikamoi Preserve. It is managed by The Nature Conservancy and is one of the last strongholds of some of the most endangered birds in the world. Last week, I had the opportunity to go birding on the property with TNC docent Chuck Probst. Access to this area is controlled pretty tightly, and I felt very privileged to spend a morning there. I must say that I was somewhat anxious before driving up Haleakala again. On my first visit five years ago while on my honeymoon with my wife, I drove through some of the worst weather conditions I have ever seen while headed to the summit for sunrise. Luckily, this time it was crystal clear on my early morning drive. I arrived way ahead of schedule (since I had anticipated a frightful drive to Haleakala National Park’s Hosmer Grove) so I was able to spend a little time birding in this seemingly out of place environment. Hosmer Grove was replanted with exotic coniferous trees in the early 20th century after all of the native trees had been harvested. It is hard to blame Hosmer, as they did not really understand at the time the importance of native flora and were trying to create a viable timber industry. While these are not native trees, some of the more numerous endemic species (not that any of the species are really common) call Hosmer Grove home. It was there that I was reminded of why these little birds hold a special place in my heart. 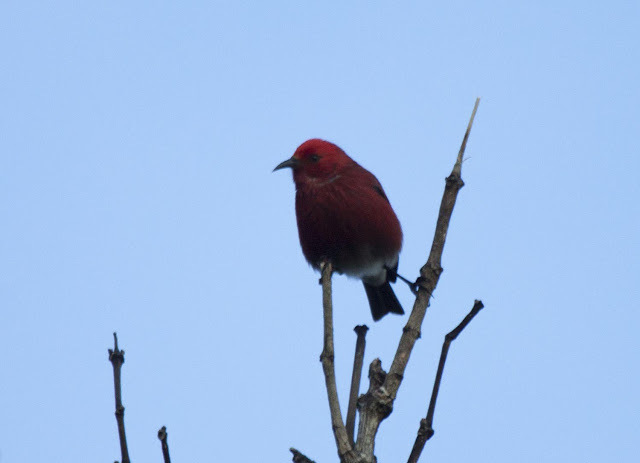 I was greeted by the songs of ‘Apapane and ‘I’iwi as they flitted about in their glowing red plumages. An 'Apapani perched high in a tree. As I stood in awe of these little birds, Chuck arrived and explained where in the 5,230 acre preserve we would be going. Our destination was the Rose Gardner Memorial Boardwalk. 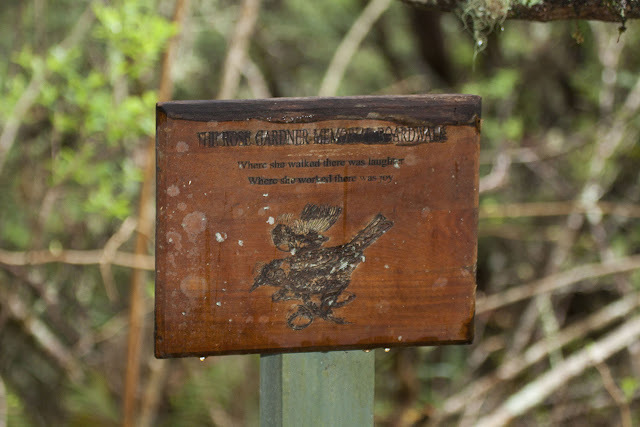 Rose Gardner loved the preserve, and when she passed away, she left about $40,000 to a friend who in turn decided that the best use of the money would be to donate it to TNC so that they would make Waikamoi a little more accessible for visitors. This spot is just about the only place where birders have the chance to see Kiwikiu (Maui Parrotbill) and ‘Akohekohe (Crested Honeycreeper) without a very serious wilderness adventure. A sign at the start of the boardwalk. Just a short ways down the trail, while still on private property that you must pass thought to get to the preserve, we stopped to take a look at a couple of ‘Amakihi. We were both shocked when we put our binoculars up and saw a Kiwikiu with the ‘Amakihi! Not only were we able to get amazing looks of this individual, I was able to snap some photos. 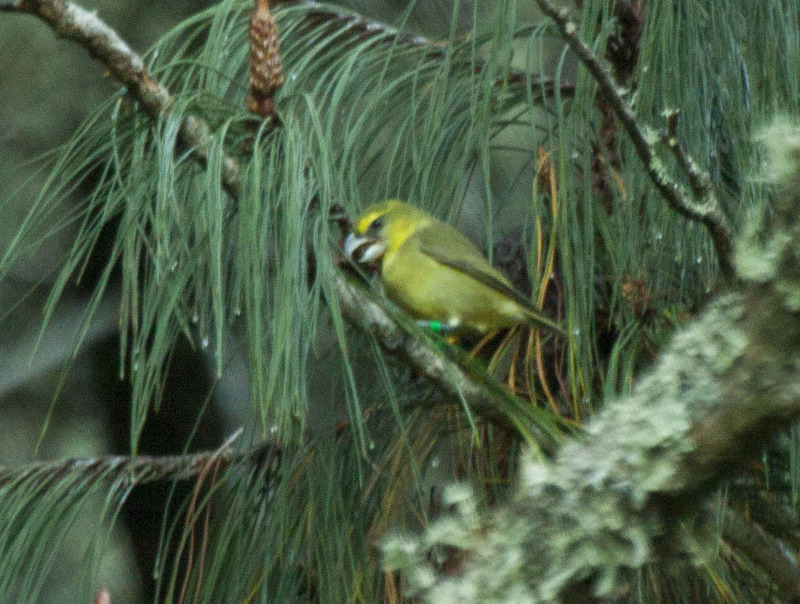 A blurry but identifiable photo of the Kiwikiu that we found! This was the first time that Chuck had seen a Kiwikiu in this particular area, and he has been birding here for almost 20 years. This species is only found on Maui and is on the critically endangered species list with an estimated population of only about 500 individuals. Like almost all Hawaiian endemic species, loss of habitat has seriously affected the Kiwikiu population, and it is now restricted to the little bits of quality habitat that still exist. Since I was able to get photos of the bands on this bird and post to Hawaii Birdwatching Facebook page, the Maui Forest Bird Recovery Project was able to confirm that it is one the birds in their study and that this after second year male had actually just been banded a few weeks prior on January 13, 2013. They also informed me that it was banded quite a ways away from the location where we found it. Their 2013 field season is beginning soon, and they hope that they will be able to find this individual and see where he ends up. Up until 2010, I would not have been able to use a Hawaiian name for this species. There was either never a traditional name for the Parrotbill or more likely, the name had just been lost over the years. Hawaiian scholars created the new Hawaiian name for the Parrotbill and held a renaming ceremony right in the very spot where we saw the bird! Please visit my personal blog, www.blog.nuttybirder.com, next week to read more about my visit to Waikamoi and the rest of my Hawaiian birding adventures! Cool post and the birds are beautiful you saw in Maui! Thanks! It is always so exciting to see rare endemic species! Totally envious. I'd love to bird Hawaii some day! You definitely should! A lot of the species are in serious trouble so the sooner the better! Os pássaros são as joias da natureza. How fortunate you were to go birding at Waikamoi Preserve. It sounds like a magical place. Congratulations on the Kiwikiu sighting. Very exciting! Thanks Julie! It was a truly magical experience! We didn't make it to Waikamoi preserve but did find some cool birds at Hosmer Grove at Haleakala NP. We'll have to definitely visit Waikamoi preserve next time we're in Maui. Nice post! You will love Waikamoi! The hikes are really irregular there so try to get it set up very early! I am so envious - I know I'll never to get see this preserve. Great post, Rob!